A couple of weeks ago I was writing about the new Spring and Summer 2015 yarns and designs looking out at a cold snowy landscape; this week I’m writing about Esk, a cardigan in Brushed Fleece designed by Martin Storey sitting in hot sunshine…….well I am in San Diego……although the photo’s were taken a week ago in Jackson Hole, Wyoming. 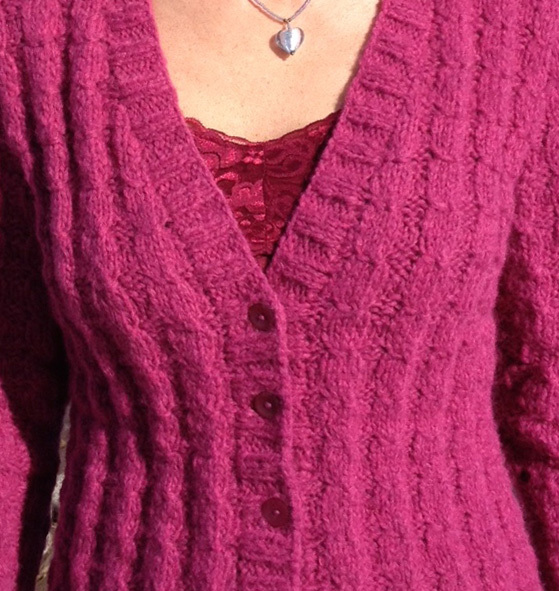 If you are a regular reader of my posts you’ll have noticed that I tend to knit cardigans. This is because I live in Colorado where the temperature can fluctuate vastly in one day: -10°C to 20°C (14°F to 68°F). A cardigan allows me to layer and button-up when it is cold in the morning and then unbutton when it gets a bit warmer during the day but still need my arms covered or take off completely without messing up my hair……yes…I am vain! You may recall from a previous post that while I visited Rowan Mill last year I tried on Martin Storey’s Esk. Here I am in Esk at the Mill…….. I loved the shade (Grotto 257) and the feel of the Brushed Fleece yarn but was not sure that the short length suited me. I asked some of my fellow ambassadors and they said I should make it longer, so I did. Would love to have knitted it with short sleeves also but I think they looked better with the short body length. Not only did I make Esk longer but I also shaped it very slightly at the waist. I didn’t do this by decreasing and the increasing stitches but by gradually using smaller needles from a 6mm to 5.5mm to 5mm at the smallest part of my waist and then gradually back up to a 6mm. It worked really well and you can’t see a change in the needle size in the knitted fabric. 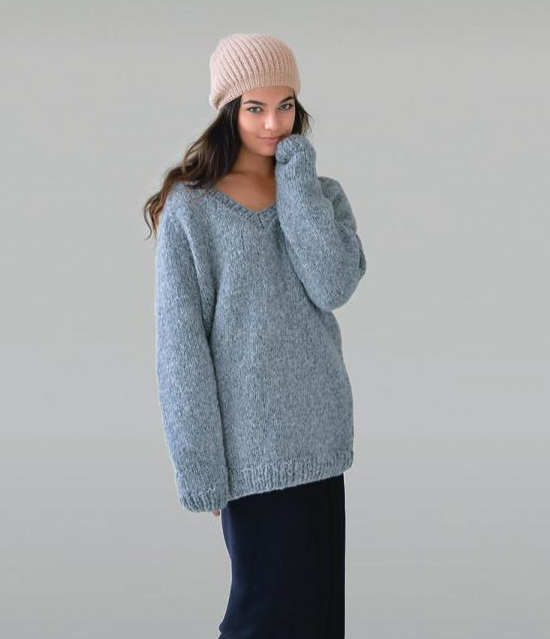 Brushed Fleece knits up to a very cuddly fabric. It is very light and lofty and so soft next to the skin. This is not surprising as consists of 65% extra fine merino wool, 30% baby alpaca and 5% polyamide. I just love that baby alpaca! It gives the yarn it’s soft and lofty quality. It is warm to wear but not excessively so which makes it great to wear on it’s own or to layer for extra warmth. I think my Esk cardigan will come in handy during the winter/spring weather transition. The stitch is created by inserting the right hand needle through the middle of a group of four stitches knit wise and pulling a larger than normal loop through, knitting the four stitches and then ‘casting-off’ the large stitch over these four stitches, in effect, wrapping the stitches. It makes it look a bit like cable from a distance. The wrapping of the stitches ‘pulls in’ the group of four stitches giving them a rippled effect. It is also incredibly easy to do and memorize which makes it a very quick especially as it is knitted on 6mm (10 US) needles. I completed my cardigan in about three weeks but would have been so much quicker if I wasn’t so busy with all the other things going on in my life. Wouldn’t it be nice to knit all day everyday without interruptions! There are lots of other designs available using Brushed Fleece. 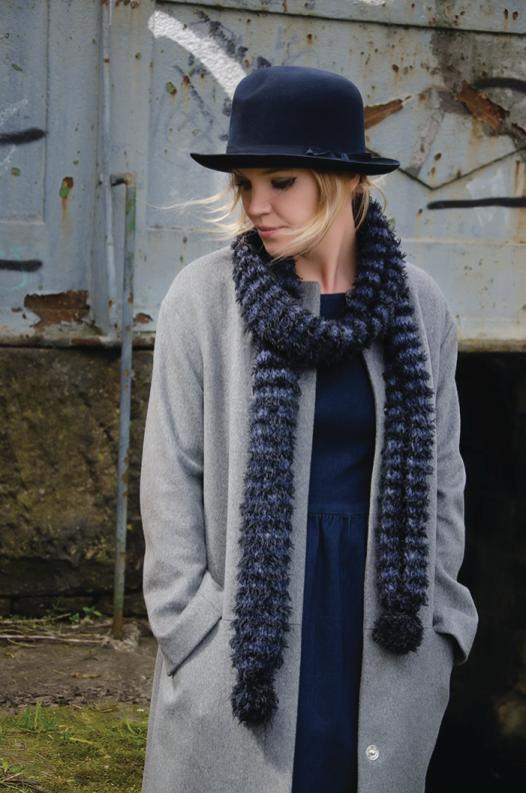 Maybe you would prefer to knit a long-line cardigan like this one called Heart designed by Kim Hargreaves in her book titled North. Or this one called Drab, also by Kim Hargreaves from her book North. Not drab at all! Or maybe you’d prefer something more fitted like this slipped rib stitch sweater called Neath from the Brushed Fleece brochure designed by Martin Storey………..
How about a really quick knit like this striped scarf with pom pom trim called Muddy from the book North designed by Kim Hargreaves using Brushed Fleece and Fur. 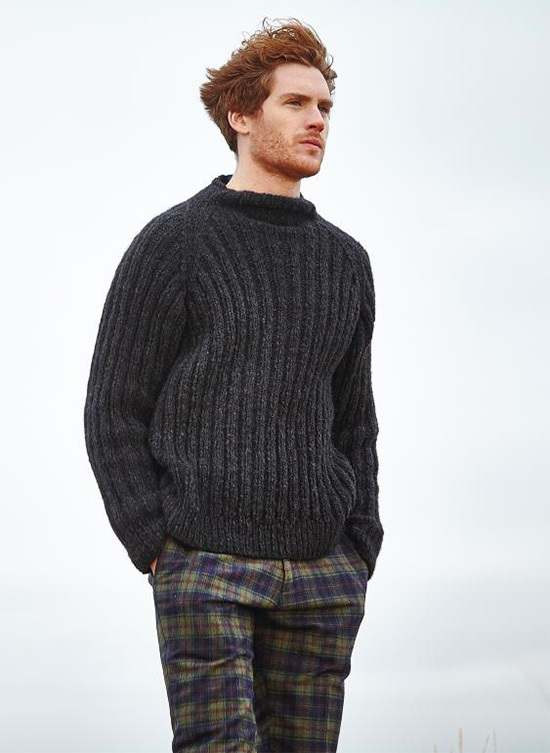 Or this rib sweater called Trent from the Brushed Fleece brochure again designed by Martin Storey. It has a funnel neck and raglan full length sleeves and is suitable for the beginner knitter. I think this would look great on my husband, Neil. And you can choose from these 12 shades………. If you would like to read another post where I mention Brushed Fleece, the yarn Fur and other designs click here. 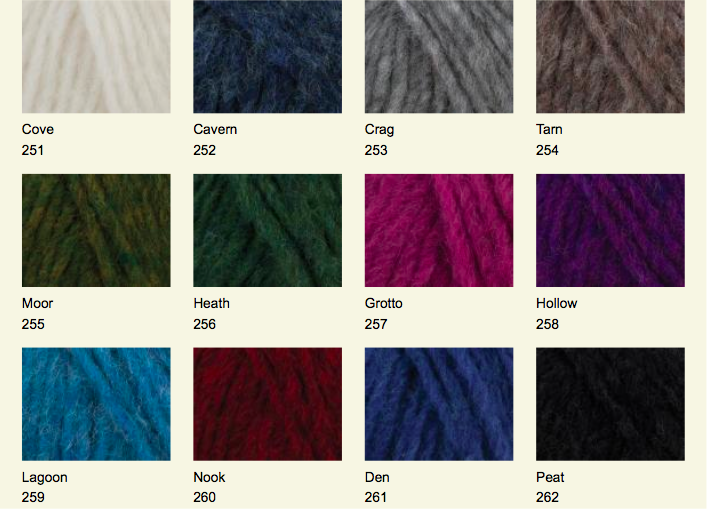 Maybe you have already knitted something using Brushed Fleece? I would love to know what you made and if you made any changes to the design. Please leave a comment at the bottom of this post; it’s great to share your techniques and ideas with me and my other readers! Click on the links below to see all the designs from the brochures mentioned in this post. And if you would like to go directly to my post about the new Spring/Summer 2015 yarns and designs, click here. I try to post images of my latest knitting projects on my What Colours Make Facebook page. Click What Colours Make to take you there. If you do take a look….while you are there please “Like” my page if you like it! Thanks so much for reading my blog. To receive email notifications for my new blog posts please click here to subscribe. 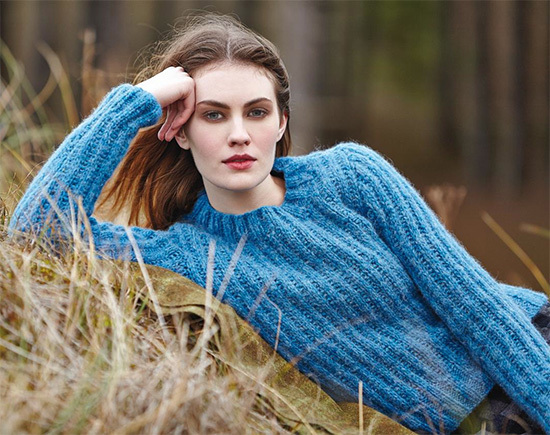 This entry was posted in Knitting with Rowan Yarns, Rowan Yarns Collections and Newsletters, Rowan Yarns Information and tagged Brushed Fleece, cable stitch, cardigans, Fur, kim Hargreaves, Martin Storey, Rowan Ambassador by Esther. Bookmark the permalink. I love your longer version of Esk too. Can you tell me how many balls you used to make it please? I am very tempted to knit it for myself over the Christmas hols. Hi Judy, I added 2 extra balls to the small size but it does depend how long you want to make it and what size you are going to make? Err on the side of caution and buy one more than you need. You can work it out accurately but maybe that is for another blog post! Thanks for your quick reply! I am going to knit the small.size which states 5 balls..so 6 should be enough? And how tall are you….I am 5ft 8ins? Judy, I would buy 2 extra balls to be on the safe side…….buy 7 in total. Just discovered your blog. I love how you used smaller needles for shaping, I’d never heard that before. I like my clothes not snug, just a little fitted. I’m fairly new at knitting, and making my first cardigan. I’m going to try this shaping with smaller needles. About how far down the cardigan before you changed to the smaller needles, and about how many rows would you say you knitted for each of the smaller sized needles? Here in hot and humid Houston, because of the full blast of airconditioning, it is always freezing cold when you enter a building, restaurant, office, cinema, or mall, so I like bringing along a cardigan. Love the idea of using smaller needles to get a bit of shape in the sweater. Nice job! It’s lovely. Great color, after the dark winter days one needs bright colorful things to feel happy. I’m trying to knit ‘eloise’ (magazine 57) it’s a Marie Wallin design, I hope I can crochet the flowers like in the magazine . 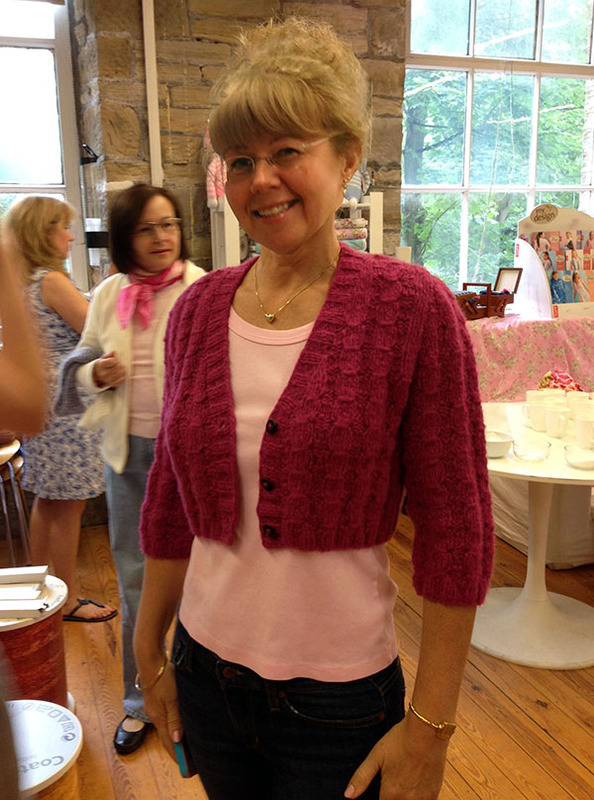 I knit a lot, I crochet seldom …. we’ll see. Thanks Fabienne. I intend to knit Eloisa too! I have some Panama in pink. Like you my crochet skills are nowhere as good as my knitting skills but I hope to be successful. I know I will probably arrange the flowers more symmetrically around the neck though. I think it will be a lovely little top without the flowers too! Your Esk is beautiful. I prefer it to the original, as I too could not wear the short version. Your alterations have made a gorgeous cardigan. Thank you for sharing.